If you are like me, you like to use your lawn mower as a bit of a mulcher machine. Maybe you like to monster some stray branches or other plant material such as flax (which can go all stringy and cut stuck around the blade) and you simply run over them with the mower to get rid of the waste. Do this enough times coupled with hitting the odd stone or when you accidentally maneuver the blade onto concrete or brick you've got a blunt blade. And if you're blade is blunt, the grass isn't being cut as well as it should - meaning more work for you, especially if the grass is wet. How sharp should mower blades be? Blades should be sharpened so they are like a pair of scissors or butter knife, and not like a boning knife. A knife edge will get dull much faster. What angle should mower blades be sharpened? Most blades leave the factory with the blade sharpened at a 45-degree angle. You should aim for the same. If you are ever in a lawn mower store, have a feel of the blade - you'll note it is not honed down razor sharp! Can I sharpen a lawnmower without removing the blade? No matter how you choose to sharpen your blade, the first thing to do is to disconnect the spark plug by removing the spark plug wire. This is to prevent the engine from accidentally starting if the blades generate enough pressure to turn the engine - either when removing it or sharpening. Yes, you can. It's a little tricky but can be managed. As usual, disconnect the spark plug first. Turn the mower on it the side so that the air filter and carburetor are facing up (to avoid oil spillage), grab your file and file the blade at 45 degrees. Make sure you do even strokes on either side. 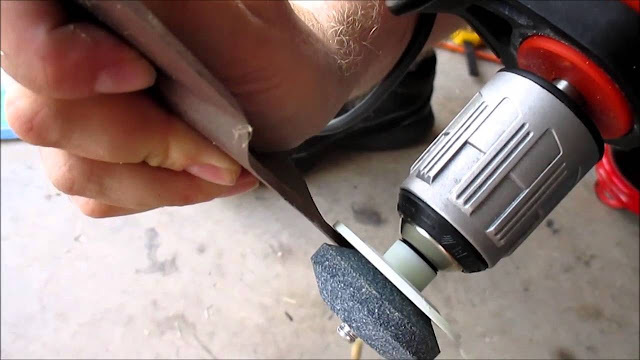 This is a quick and dirty way to sharpen the blade. You run the risk of sharpening unevenly and make the blade unbalance. We recommend you take the blade off. Mark which is the downward facing side of the blade with a Sharpie of similar. This is so you do not accidentally re-attach it upside down. Remove your blade from the mower and clamp the blade in a vice. Wear appropriate safety gear, especially safety eyewear. Sharpen the blade with a file. Your strokes should go from the inside edge to the out. You should aim to sharpen at a 45 degree angle. Your mower blade is sharp enough when it feels like a butter knife - that's suitable enough to cut with, given the force that occurs when it rotates under engine speed. Reinstall the blade the correct way up. A standard file is all you need. You can use your home handyman drill to sharpen your blade, with the right sharpening attachment. Usually made of the abrasive corundum (a crystalline form of aluminum oxide), these sharpening aids can be found fairly cheaply on Amazon. Note which is the downward facing side of the blade with a marker. This is so you do not accidentally re-attach it upside down. Remove your blade from the mower and clamp the blade in a vice with the cutting part of the blade face up. Add the attachment into the drill. Put your safety classes on! Line the bevel of the drill up to the blade. This will guide you as you use the drill. Use a light degree of pressure. Flip the blade over in the clamp and repeat. You can also use a rotary tool such as a Dremel, angle grinder or a belt sander to sharpen the blade in the same fashion. Just use the tools in a safety conscious fashion and you'll be fine. After you have sharpened the blade, you can test its balance with a blade-balancing tool. If you don't have such a tool you can try the classic trick of hammering a nail partway into a wall and hang the blade from it (using the center hole). If the blade hangs horizontally, it is perfectly balanced (as all things should be). If one side lowers, you can lighten that side with your file or grinder. It's usually recommended that Material should only be removed from the end of the blade, in the sail area. 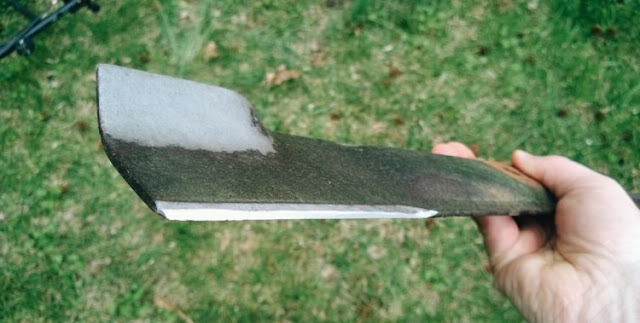 How often should I sharpen the mower blade? Many users sharpen the blades at the beginning of every grass growing season. It never hurts to check and give it a tune-up if you frequently use the mower, especially if you've caught a few rocks or mulched some wood with it. My blade is pretty damaged, what can I do? If your blade has done a diligent service but it's full of cuts and nicks it's probably time to replace it. You can find plenty of replacements on Amazon. They are usually measured in inches, so make sure the size your order matches that of your machine! Can I put a mulching blade on my mower? If you want your lawn mower to do some heavy action mulching - you might want to consider attaching a blade designed to mulch grass (rather than simply cutting the grass). When using such a blade, it is usually recommended that you leave the grass to be a little bit longer than you would an ordinary blade. You will probably also find you need to sharpen a mulching blader more regularly than a regular blade as they come into contact with the grass more. Thinking of checking out a cordless electric mower? We've got you covered.